I hope none of you are fans of the blues or rockabilly, because you’re about to watch the things you enjoy become tainted with Harry Dinkle, and you’ll never get any pleasure from them again. I’m guessing Batiuk took a vacation to Memphis recently, and we’re all going to pay. I don’t know what kind of a monster that is in panel one, but it appears to be wearing Mort Winkerbean’s skin. What godawful drawing–Burchett should be ashamed. Contrast that with Dinkle’s face in panel two–he gets the full “handsome” treatment, as well as a little action whip-around. What a loathsome thing Dinkle is–as I’ve said way too many times, of all the cast in this miserable comic, Dinkle is the one I hate the most. He always triumphs, he’s always praised, and always beloved. He’s one of the reasons this strip will never be noteworthy. Well color me stunned…this premise is GOING somewhere! Unfortunately, that place is Memphis. At least it’s not Dayton, so there is that. It’s funny how FW works. 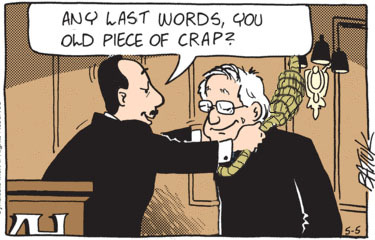 Back when Mort was a barely conscious Alzheimer’s patient I detested how the strip was once again mining for pathos in that shameless FW way, yet now that he’s a hilarious peppy old coot I detest that too. What was the whole point of that long-ago arc? Why didn’t he just have Mort be a hilarious peppy old coot all along? 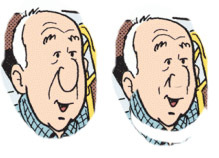 Were those morose depressing Alzheimer’s strips even necessary at all? If it all meant nothing narrative-wise why do it at all? And if the stories end up being retconned and forgotten why is anyone reading this strip at all? It’s all so bizarre. Batuik can’t write separate and distinct characters anymore. Almost every conversation is sliced between the ‘Dominant Voice’ of wacky ideas or hope and the ‘Submissive Voice’ of wry observations. With the rest of the crowd watching passively. And anyone’s personality, disability, or history is completely pliable to shove them into their roles. It’s like some kind of horrible, sexless, roleplay between clones, endlessly producing a sterile copy of itself. Everything changed re: Pa Bean when he started smoking. It’s all so bizarre. Remember, putting his dad in a home was a MAJOR story arc that led directly to his car crash and coma AND it kick-started Starbuck Jones too and now it’s all forgotten, like it never happened. No wonder he doesn’t release collections of these strips, if you sat down and read them in chronological order it’d make less than no sense at all. You know what the “putting his dad in a home” arc didn’t lead directly to? I’m convinced his motivations for this strip are two: 1- get to that 50th, and 2- awards, awards, awards. Maybe it wasn’t dementia. Maybe he just became non-responsive around Funky because, hey, wouldn’t you? Ghost of Dead St Lisa bangs Ghost Elvis, Gets Paranormally Transmitted Ghost Diseases… Leading to Spectral Cervical Cancer. Let’s not forget a week to be spent on Beale Street, where Dinkle thinks he channels W. C. Handy. Uh, sorry, Becky. What godawful drawing–Burchett should be ashamed. I tell ya, I know zilch about comic books and comics artists from this century…just because I never heard of Rich Burchett before Batiuk tapped him to be his “inker” doesn’t mean he hasn’t made a name for himself in the industry. While we’ve assailed the artwork around here for years (the less-realistic Act I renderings at least had a genuine—and consistent!—cartoony style), since Burchett’s come aboard I think the drawing’s gotten even worse and more inconsistent. Hatchet faces and pinto bean shaped heads abound, the women generally are even less attractive/feminine, Les’ goatee gets more and more abstract, and Mort and Funky are now played by the same actor. At times they even talk alike. What a crazy pair! This doesn’t make much sense to me. I’m pretty sure a bunch of seniors stuck in a crappy nursing home could probably find a better use for free money then flying to another state to record a destined to be terrible album. I’m guessing Batiuk took a vacation to Memphis recently, and we’re all going to pay. Wow, so he says he researched a story. Why do I have this feeling the story will be as deep as the abandoned old house Funky walked in to? That story was researched too. Thanks for refreshing my memory, as I KNEW I’d read something about Memphis before but I didn’t remember whether it was some long-lost forgotten arc or a long-lost forgotten TB blog post. Great. Look for studio personnel to show up as Real Guy cameos in a future episode. Mort might be an Animorph who recently came into contact with either a tapir or an elephant seal. “Wait! Y’all got it wrong. I’m going to Sun Studios to record an album called ‘Walt Washington plays Woody Herman’. The studio’s already hired my sidemen. None y’alls going. I told you muthafuckas we should rehearse “Woodchopper’s Ball”! Tonight we had “non-human monster”, “peppy old coot”, “Ghost of St. Lisa”, “pinto bean shaped heads”, and “elephant seal”! What a glorious time to be a Son of Stuck Funkian! Oh, goody.A week or so dedicated to looking at a clueless old man’s holiday photos as he treats us to his wry and totally off-kilter observations. Not only will something good be tainted by Hatey Sinkle, he’ll make the rockabilly era seem dull and pointless as Mopey Elvis moans about how terrible it is to be famous. What do you think the odds are we get ghost Elvis telling ghost Lisa that Starbuck Jones inspired his musical career? Why would anybody want to go all the way from NE Ohio to Memphis to record some music when there are recording studios in Cleveland? Once again the story is becoming contrived. Of course, Batiuk doesn’t give two sh!ts about logic or the audience’s willing suspension of disbelief. And Batiuk won’t even TRY to defend this plot twist. Batty uses big words and claims to be an artist, so more is expected from him. If his trip inspired him, then write something inspiring and interesting. Instead we know he will just shoehorn in some things that he thinks are cool and artsy. Then on his blog he will rave on about how the inspirational moth flew into his ear, blah blah blah…. A quick Google search shows at least 50 studios in the NE Ohio area. And another search says using a laptop and its CD burner to record them is a bit much. In the past, when BatHack (emphasis on “hack”) wrote something forced and contrived, I wrote it off to his inferior ability to tell a story. I almost excused him for adding some nonsensical, improbable twist to get a storyline to go somewhere. If anything, I came to expect it. But there isn’t enough room in the high school’s gym and mattress warehouse facility to store the heaping pile of forced and contrived that BatWit is dumping on us here. And now, we are asked to believe that not only do they require a professional studio and engineer to capture the subtleties of their wonderful musicianship, the only studio capable of this task is in Memphis. This sounds like something Batty dreamt after eating a rancid batch of his mom’s liverwurst casserole. Why not also have them all sprout wings and fly down to Memphis?? Next: Through a set of circumstances more painful and forced than a clinical case of severe, life-threatening constipation, the resulting CD wins a Grammy. Don’t you dare touch that dial! Listen you whippersnapper, I’m 63 and I understand crowdfunding! Aside from that I agree everything else in your post. Now get off my lawn! Nobody in their right mind would record at Sun in 2017 – it’s tourist tour ground zero. My cousin knew some folks there and was able to cut some tracks kinda during quiet time some time ago, but since then the Memphis marketing machine has taken over. Meanwhile, WTF is up with that speed/turn line on Dinkle’s head? The colorist (I assume some third world sweatshop worker) has turned it into a cranial tether to nowhere… Speaking of which, WHO does the actual coloring? I assume that by this point TB neither works on nor cares about what his trophy candidate actually looks like as a finished producr.